One of our favourite things to do when travelling is to visit a local market. They’re bustling, busy places full of local flavour, culture and atmosphere. And they’re a great way to mix with locals and practice (!) your language skills. Another reason we love markets is that they’re chock full of photo opportunities, with vibrant colours, luscious fruits and vegetables, unusual food and characterful people. And of course, most markets have at least a few stalls selling good cheap food. We’ve been to markets nearly everywhere we’ve travelled, and we never feel we’ve truly experienced a place until we’ve been to a local market. So we were thrilled to hear about the famous Guatemalan Chichicastenango Market while backpacking through Central America. The town’s name has a musical ring to it, and people often ask what does chichi mean in Spanish? Well, Chichicastenango (Chichi) means “the place of the nettles” in the indigenous language of Nahuatl. 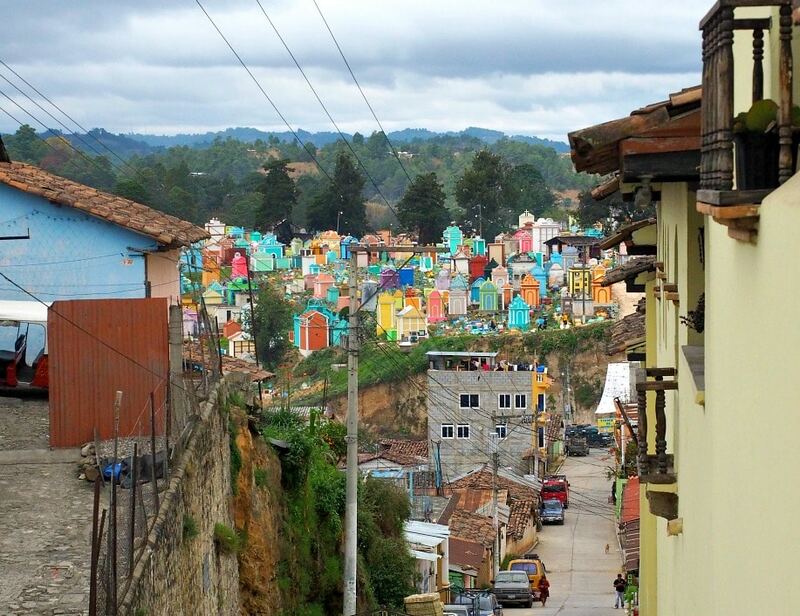 Chichi is a traditional Mayan town located in the Guatemala mountains of El Quiché. About 140 kilometres north-west of Guatemala City. Every Thursday and Sunday is market day and the town explodes with sights, sounds and smells as people arrive from all around. Locals walk throughout the night from villages around the countryside to sell their goods at this epic Guatemala market. 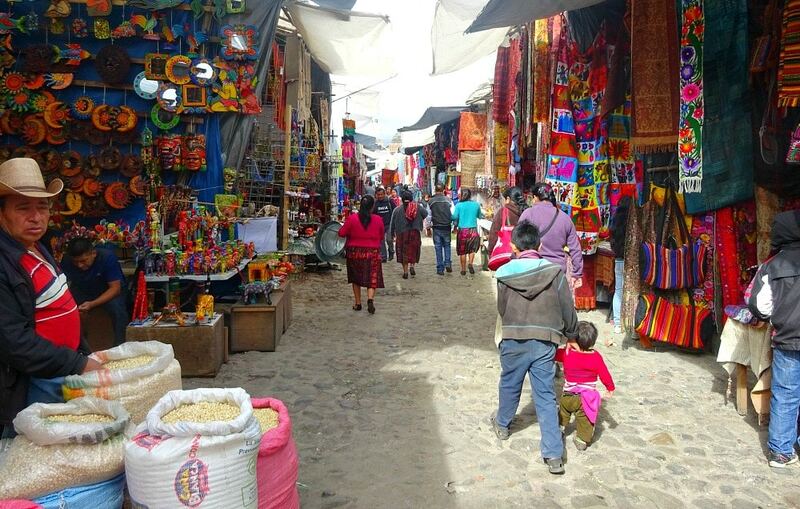 The Chichi market is huge and takes over the entire central area of town. In fact, it’s said to be the biggest in all Central America. 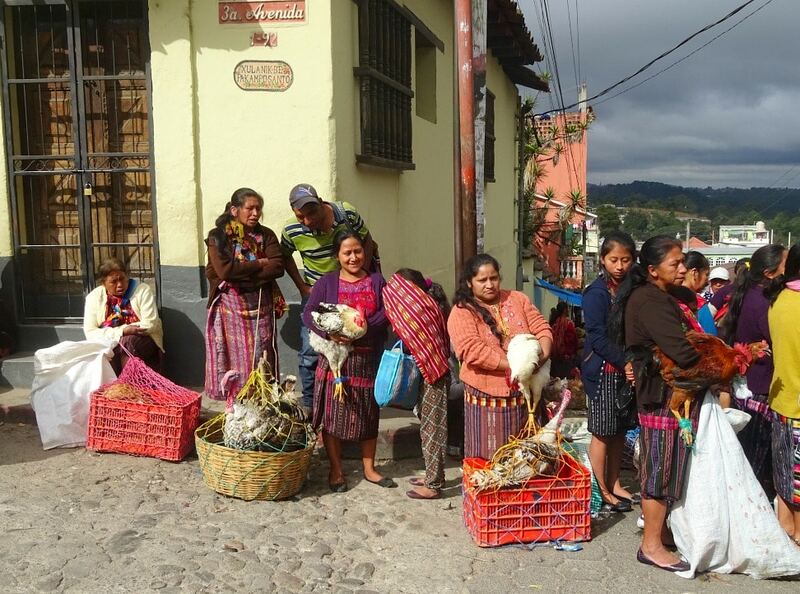 So if you’re wondering what to buy in Guatemala, then this is the best market for you! Chichi market is considered a safe place to visit and we never felt uncomfortable. Quite the opposite in fact. However, the market is crowded making it easier for sneaky thieves to get their hands on your valuables. I always use an anti-theft travel bag when I’m on holiday. You can read my review of the best anti-theft travel bags here. Or you can click here for more information about my favourite bag to travel with. Here are some tips to help protect yourself and your belongings so you can keep enjoying your Guatemala travel. Be aware of your surroundings. This can be hard to do in an overcrowded market but do your best to stay vigilant. Don’t flash great wads of cash around, and keep your valuables out of sight. If you use a backpack hold it in front of you where you can see it. Tuck your phone safely away in your bag. Keeping it in your pocket is a disaster waiting to happen. Keep the majority of your cash hidden away and only have small amounts handy for making purchases. 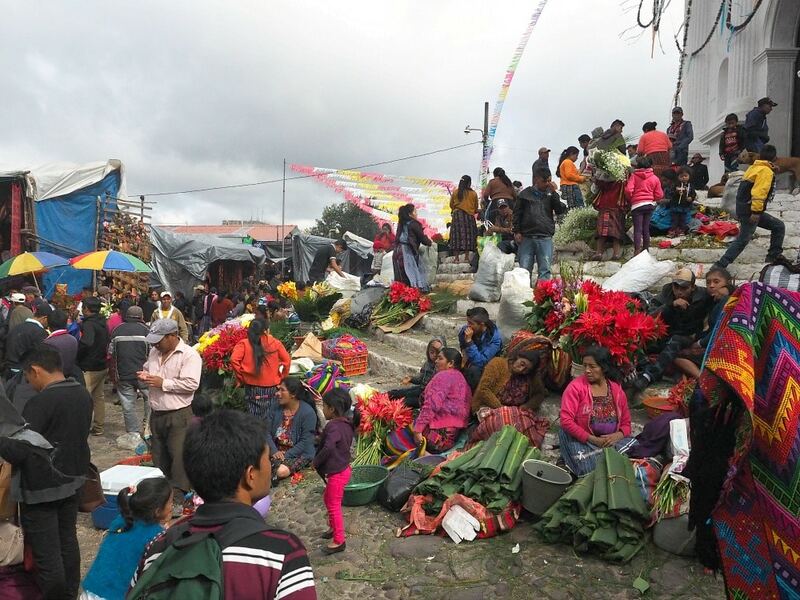 Guatemala tourism is on the rise and as I said earlier Chichicastenango market is huge. We’ve heard people complain that it’s not “authentic” enough. But in all honesty, we didn’t find this at all. The market had far more locals than tourists visiting on the day we were there. And seriously, Chichi Guatemala hardly compares in tourist numbers to places like Thailand and Europe. And despite the tourists, it remains a necessary part of indigenous life not only for daily necessities but for social interaction as well. It’s also a great place to pick up Guatemala souvenirs and gifts. 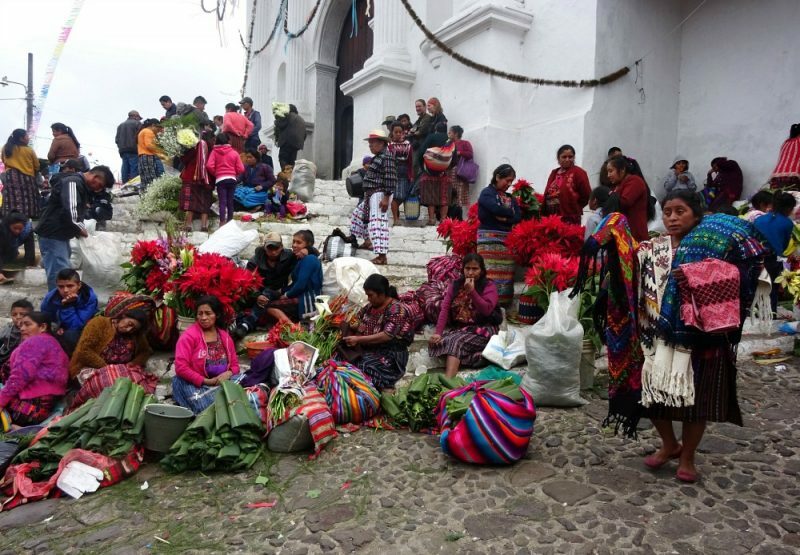 Here are a few tips to help you get the most out of Chichicastenango market Guatemala. The Sunday market has more stalls than on Thursday and if you’re lucky there might even be a parade! There’s no need to take snacks or lunch as there are restaurants all over the place selling delicious Guatemalan food. Be environmentally friendly – say no to plastic and take your own bag to carry your purchases in. If you need a break have a timeout on the stairs of Santo Tomas and enjoy some people watching. Don’t be shy to test out your haggling skills, the vendors expect it. The usual practice is to halve the original asking price and go from there. Just keep in mind the time and effort the artisan put into making the product. And remember while this may be a fun holiday experience for you, it’s how the vendor makes a living. It’s a good idea to take more cash than you think you need. There are loads of enticing things to buy and it would be awful to miss out simply because you ran out of cash. There are a couple of ATMs in the surrounding streets if you do run short. But, they’re unreliable as they often run dry or simply don’t work. We visited Chichicastenango while staying in the hippie village of San Marcos at Lake Atitlan. You can visit as part of a tour or on your own and it’s one of the best places to go for a day trip. We booked a tour through the guesthouse we were staying at. But you can make arrangements at any of the travel agents in town. They call it a tour but it’s essentially transportation as you’re dropped off in Chichi town and left to enjoy the market on your own. The shuttles from San Marcos were full on the day we wanted to visit. Which meant we had to catch a water taxi to Panajachel and meet the shuttle there. It wasn’t ideal as we had to get up at the crack of dawn and wait at the dock for an hour until the bus arrived. But it was definitely worth it. If you’d like to book a tour then head to one of the many tour agencies around the lake. They’ll make all the arrangements for you and all you’ll have to do is meet them at the pickup point. In San Marcos, pickup is near the basketball courts, and in Pana, we were picked up at the docks. The pickup time is usually 8.00 a.m and the return trip is around 2.00 p.m.
It’s possible to visit Chichi using local transportation, but it’s tricky as you’ll need to catch not one, not two, but six chicken buses! But, if you’re up for some adventure it’s a cheap way to travel. Chicken buses are a lot of fun and we used them to travel all over Central America. But for us, catching six buses was too much effort for a simple day trip! 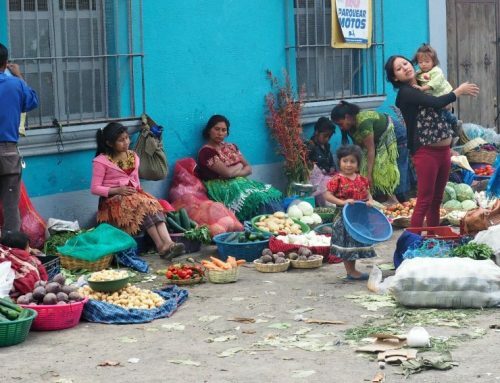 You can visit Chichicastenango market from other popular Guatemala tourist destinations. And Antigua, Guatemala City and Quetzaltenango (Xela) all have shuttle bus services. The shuttles are comfortable by Central American standards and have a better safety record than local chicken buses. 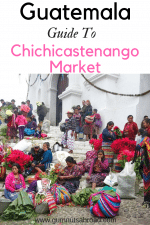 Most travel agencies offer day trips to Chichicastenango on market day. The tours arrive in the morning and visitors have several hours to explore the market before leaving in the mid-afternoon. Tip: There are only two market days a week so be sure to book your tour in advance as they often fill up. I would have liked more time to explore Chichicastenango. And if I had my time over again I would arrive the day before and stay overnight. There’s more to this traditional Mayan town than the market and it has a few attractions that are worth exploring. Including several churches, a museum, shrine, mask workshop and an interesting cemetery (see below). Locals from the surrounding area gather at the market to sell their wares. And it would have been fun to see them arrive and experience the setting-up of the stalls as the town transitions from non-market to market day. 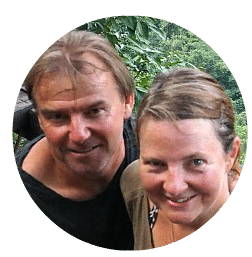 For information on where to stay in Chichicastenango Guatemala click here. If you’re like us and enjoy markets, then a trip to Chichicastenango market should be on your list of top things to do in Guatemala. 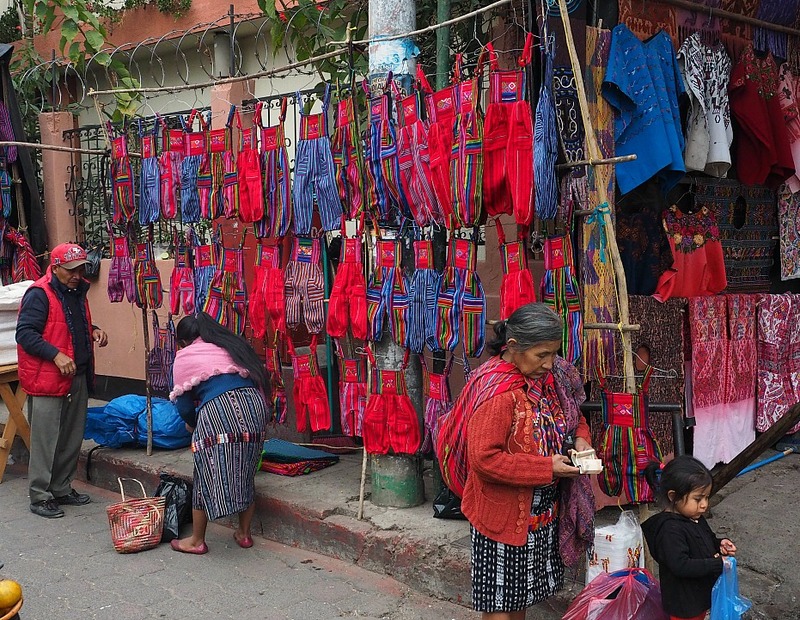 People have been shopping in this Maya market for hundreds of years and it’s a wonderful way to experience the Guatemalan culture. The local population are indigenous Maya K’ilche who still practise the Maya religion. Most people wear traditional Guatemalan clothing. And I felt rather drab in my tatty travel gear next to the women in their beautifully handwoven skirts and tops. The town was buzzing with people who had come from all over the region and we set off to explore the market madness. The narrow streets were jam-packed with stalls, each one a riot of colour exploding onto the next. The market stretches endlessly and seems to take over the entire town. Navigating the labyrinth was impossible and we were quickly lost in the maze of alleyways. Each street blended into the next and we allowed ourselves to drift along with the crowd. Hundreds of vendors lined the narrow aisles selling a variety of local goods and handicrafts. 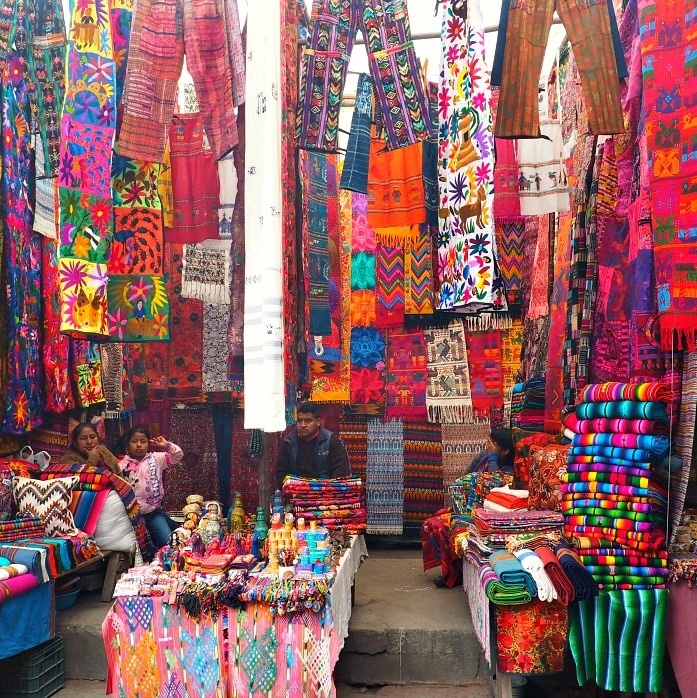 Popular items include Guatemala textiles, wood carvings, hand made jewellery, leather goods, pottery and souvenirs. The local artisans have adapted their craft to make modern items, from traditionally crafted fabric. We couldn’t resist buying an iPad cover and it was good to know we were supporting the local community. What I really wanted were some Guatemalan blankets, but alas we still had months of travel ahead. As we wandered further away from the centre, the stalls began to cater more to the locals. And we saw people buying fruits and vegetables, second-hand clothes and livestock stuffed into baskets. We drifted along until we reached the soul-stirring Santo Tomas church. Steep steps lead up to the church where locals gather to sell their beautiful handicrafts and gigantic bundles of flowers. Some of the flowers bought here are taken to the local cemetery to pay respects to lost loved ones. The air was filled with the pungent aroma of burning incense and we sat for a while amongst the chaos with the market spread out before us. As we strolled along the street we could see hundreds of vibrant tombstones dotting the hillside. We’d never seen such a colourful cemetery before and we just had to check it out. There were hundreds of graves ranging from simple plots to elaborate tombs containing several generations of families. Many of the tombs featured ornate columns and wrought iron gates and were painted in a kaleidoscope of pastel shades. The stunning rainbow of colours celebrates the afterlife and symbolise different roles within a family. And many of the tombs colours are based on the person’s family status. Be sure to allow yourself enough time to visit one of the most colourful cemeteries in the world. To get the most from your Guatemala trip we recommend using a Guatemala travel guide book. We use Lonely Planet books as they have all the highlights and information you need including maps and walking tours. They’re also available on Kindle or as an ebook. 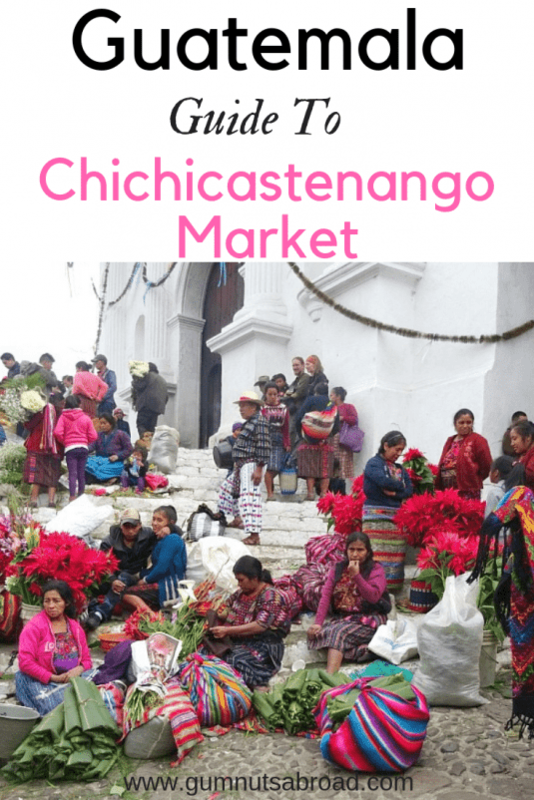 We hope you found this guide to Chichicastenango market useful. 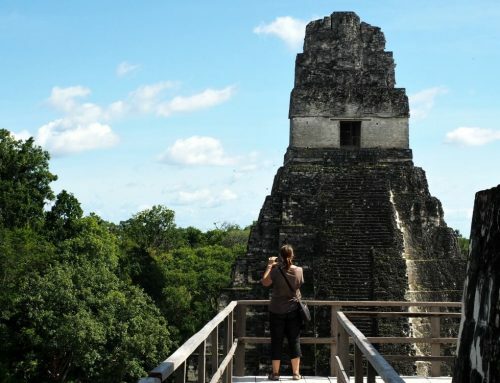 If you’re planning a trip to Guatemala then you might enjoy this guide to Tikal. For more information about Central America click here. Disclaimer: As an Amazon Associate we earn from qualifying purchases. Pop Your Email In Below And Never Miss A Post. We Flood Your Inbox. Promise! Guatemala Backpacking: Everything You Need To Know For An Amazing Trip!